QUESTION: A friend of mine has one of your original Greatest Bull Market in History books. I noticed that you quote your direct sources from newspapers and magazines rather than other people histories. Did you find the newspaper a better source of truth? ANSWER: Absolutely. I have collected newspapers from the 1600s to date. They are an invaluable contemporary source of what was being talked about and events at that moment in time. 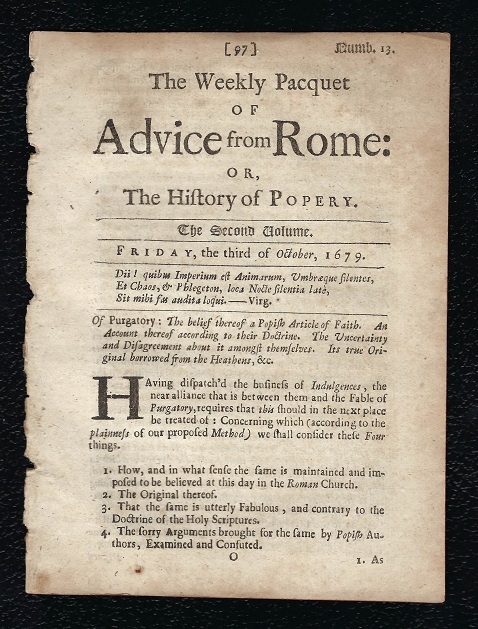 Here is a rare early publication known as The History of Popery, printed in London October 3rd, 1679. This newspaper was an example of the religious issues in Britain that led to the Civil War. This was an anti-Catholic newspaper, which is rather rare for it had a short life before it was suppressed. This one was on Purgatory stating that this is “[t]he belief thereof a Popish Article of Faith.” It goes into the brewing hatred of Catholic in England at that moment in time. You cannot get a sense of real beliefs by reading someone’s interpretation. They tend to pick and choose events or comments to support a predetermined conclusion. Take the Great Crash which has been the seminal foundation of the history of the causes of the Great Depressions. It is a total piece of socialist propaganda in my opinion. Nowhere in this book do you even find a mention of the Sovereign Debt Crisis. The predetermined conclusion was to be corporate greed and that is why we needed big government. The same is true of the Creature of Jekyll Island and countless other books. When I read Herbert Hoover’s Memoirs, and all the documentation he put in there with the letters between the heads of state, there was NOT a single book written about the Great Depression that was fair, honest and approached the subject with a quest to followed the facts to see where they truly led. I studied ancient languages. So I learned to read Latin and ancient Greek. This gave me an unusual background when I was interested in economics. 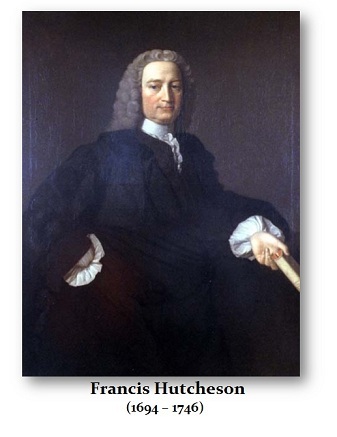 Adam Smith’s teacher was Francis Hutcheson (1694–1746) who was a professor of Philosophy at the University of Glasgow. In 1742, Hutcheson published books entitled Short Introduction to Moral Philosophy, Elements of the Law of Nature, and the third one carried the title of The Principle of Oeconomics and Politics. The latter is the book that resurrected “Oikonomikos” of the Athenian Xenophon’s work from its Greek origin during the 4th century BC giving us the word ECONOMICS (“oikos” meaning household and the complex root “nem” meaning “to regulate, to administer, to control”). To my complete shock, Hutcheson translated this into Latin as “Oeconomics” and later into English giving us “Economics” but he also followed the content of Xenophon’s work chapter by chapter. Then the very order of topics discussed in the economic portion of Hutcheson’s System of Moral Philosophy, published in1755, was repeated by Smith in his Glasgow Lectures and again in the Wealth of Nations. So it is interesting to me that the source was really Xenophon, who received no credit. Over the years, I have bought up newspapers from libraries as they close or get rid of old materials. In the good old days, they would bound the newspaper for each year. 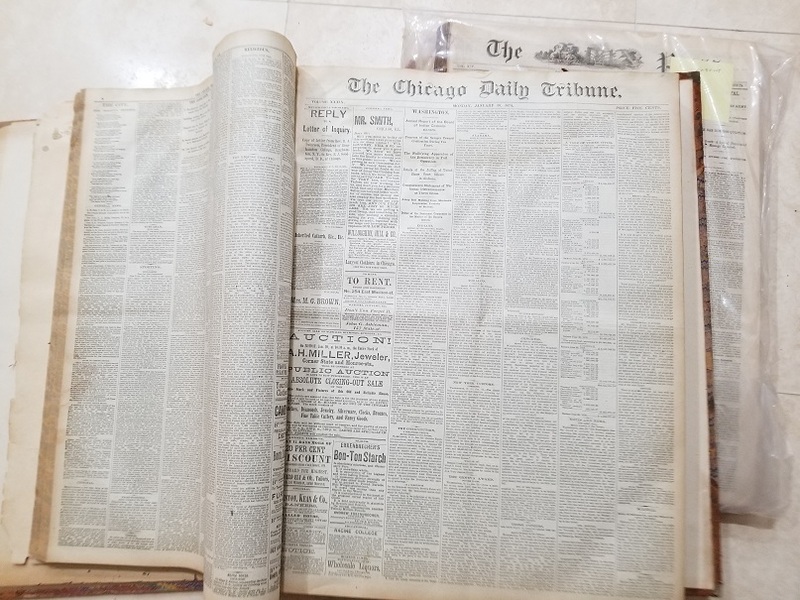 Here is the Chicago Daily Tribune for the year 1879. This has allowed by to definitively put together history from the sources of events. The media today has turned to propaganda. So the reliability of the press today on so many things has been lost. I have learned over the years to go to the contemporary sources and do not rely upon interpretations. The object of life is to learn – not to promote propaganda. I have an extensive collection of newspapers and contemporary accounts from specific events even into ancient times. When I die, I might have enough stuff to really warrant a library compared to pretend presidents pushing their legacy and agenda. I have made a fortune over the years, but I have plowed it back into research since the 1970s.